Are you looking for a composite decking choice that offers strength, durability, and is long lasting? If you answered yes to any of these than a TimberTech Decking may be the choice for you. When it comes to designing and building something as large as a deck, we expect it to last and do not want to have to replace it. TimberTech Decking offers reliable options to help you build your outdoor living space from the ground up. In the past a wood deck seemed more trouble than it was worth because of the constant upkeep and seasonal maintenance. 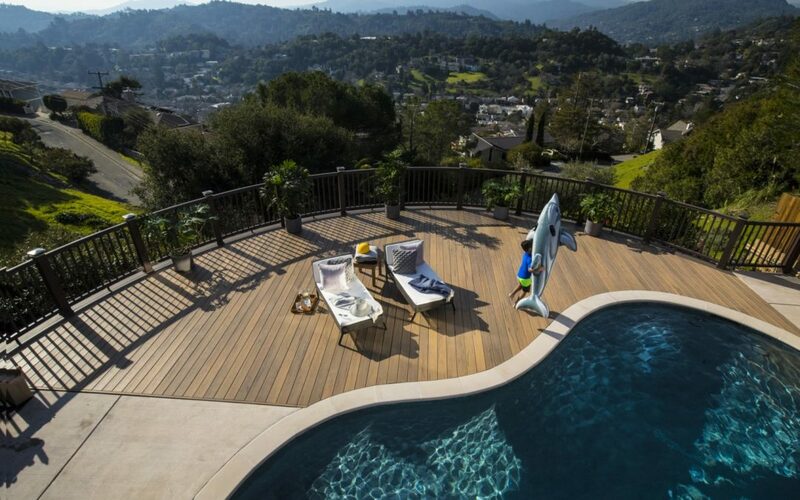 By choosing a TimberTech Deck you eliminate all of this which leaves more time for relaxing. TimberTech Decking is fast coming the gold standard for composite decking among homeowner, contractors, and deck builders. It has superior resistance to stains, mold, mildew, and scratches. TimberTech Decking does not warp or splinter and does not require staining or sanding. TimberTech Decking is completely resistant to any insect infestation. Making the decision to repair or replace a deck is not always cut and dry. Furthermore, only a portion of your deck may have issues meaning that if repairs are not done correctly you could be left with a hodgepodge of material and mismatched colors. With TimberTech Decking you have some option available when it comes to replacing, repairing, or covering an existing deck. If you currently have a TimberTech Deck and a plank or two gets damaged it is relatively easy to replace them without concern. When you deal with TimberTech Decking matching boards is not a problem. If you currently have a wood deck and want to switch to a TimberTech Deck you have a couple of choices. First of all, if your budget allows, you can remove your old wood deck and design a brand new TimberTech Deck. However, if you want a new look and have to keep finances in mind you can cover your existing wood deck with TimberTech Decking if the structure is sound. BEWARE! Before you decide to take this route, you need to carefully inspect every inch of your deck and possibly even get a second opinion. There are many problems with old wood decks such as hidden mold and rot or missing structural elements that are not visible to the naked eye. Does your deck significantly shake when it is walked on? Do you hear abnormally high amounts of creaking? Do the areas where your wood deck that are attached to the outside of your home show signs of movement up or down / side to side? Can you visibly see any mold or rot on the corners of your wood deck or underneath if you can access it? Are there any loose or missing joists? Does the current wood deck meet up to date building codes? After taking these questions into consideration determine whether you need to have the wood deck inspected by a professional or if you should take it down. Whether you re updating your current TimberTech Deck or putting in a new one, this is a top of the line composite deck that will bring you lasting enjoyment. If you are interested in updating your porch with a TimberTech Deck, don’t hesitate to reach out! Or experienced staff would be happy to talk you through the process, and give you a free estimate!